Seventh Luminato festival wraps up with sublime performances, despite rain. They weren't exactly singin' and dancin' in the rain like Gene Kelly in the famous movie musical, but for the aspiring musicians who didn't let a couple of downpours stop them from playing side by side with members of the Toronto Symphony Orchestra, the Music Mob event turned out to be a defining Luminato moment. It happened on the Saturday of the festival's closing weekend. Responding to a challenge from artistic director Jorn Weisbrodt, adventurous festival goers with a musical gene turned up at the festival hub in David Pecaut Square, bringing their instruments with them, to play alongside Toronto Symphony Orchestra professional musicians. As prep, they had downloaded the music on the program, Wagner's "Ride of the Valkyries" and Verdi's "Triumphal March" from Aida. The only problem was the bursts of torrential rain, which caused a time out between part one and part two of the program. Volunteers popped up with umbrellas to protect musical instruments when showers resumed. But they managed to complete the program. "This was one of those truly unique things that Luminato does," says festival CEO Janice Price. "We were so proud of everyone who carried on in spite of the weather, including Peter Oundjian (TSO music director), who was totally engaged." This seventh edition of the annual multi-faceted arts festival was the best one yet, both in terms of cultural achievement and attendance. Music Mob was a relatively small event during the 10-day, multi-faceted arts festival. It was devoid of the hoopla and frenzy that erupted throughout the week, but it demonstrated that the interactive and community outreach aspects are the elements that make Luminato more than just a series of enticing events in which artists strut their stuff and audiences take it all in. The greatest tumult surrounded the celebrities involved in Luminato shows, starting on opening weekend with four sold-out performances at the St. Lawrence Centre of the challenging opera The Life and Death of Marina Abramovic. No doubt it was Marina's fame that drove ticket sales but, to me and many others, the biggest thrills came from the dazzling stage coups by director Robert Wilson and the mesmerizing performance of Willem Dafoe. But when it came to creating mass euphoria, crowning the festival was the superb Joni Mitchell tribute concert, which filled Massey Hall for two consecutive nights, and will go down as one of the key "you had to be there" occasions in Toronto entertainment history. Free events at the hub drew crowds, especially at night. The festival met its box-office target of about $1 million for ticketed events. And it struck a satisfying balance between cultural treats imported from elsewhere to projects that involved Canadian talent. Among the latter: the Toronto premiere of the short Chinese opera, Feng Yi Ting, staged by Atom Egoyan — exactly the sort of thing that needs a festival setting. For some audiences who don't like it haute, a down-and-dirty treat was The Daisy Theatre — a raunchy puppet show created and performed by Ronnie Burkett. (And, intriguingly, this show is a co-production between Luminato and a performance arm of the University of California at Los Angeles). Among my favourite experiences during Luminato's talk sessions was listening to opera mavens Gerard Mortier, Alexander Neef and Rufus Wainwright agonize over which of the titans born in 1813, Verdi and Wagner, they preferred, and which they would be prepared to live without. But for me, if I had to pick just one Luminato experience as the only one I could hold in my memory bank, it would have to be the Mark Morris Dance Group, from Brooklyn. 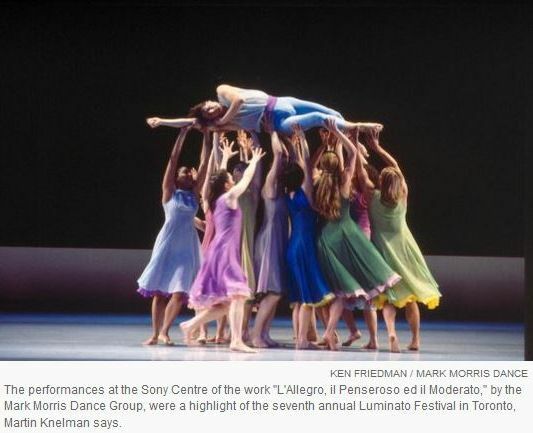 Making its long overdue Canadian debut after being acclaimed in cultural capitals around the world, was the company's signature piece, "L'Allegro, il Penseroso ed il Moderato." It's a blend of exquisite movement, Handel's music and Milton's poetry — and the only word for it is sublime. Although it didn't sell out the Sony Centre during its three performances (the last of which was a Sunday matinee), this milestone work was hugely enjoyed by several thousand people. And the visiting dancers pulled off a magnificent collaboration with Tafelmusik, Toronto's revered baroque orchestra. This experience turned out to be the greatest reason among many for this city to embrace Luminato, and feel lucky we have this festival. This article has been viewed 2,642 times since being added on July 4, 2013.